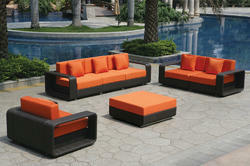 Being a well established-organization, we are engaged in providing a distinguished range of Imperial Living Room Set. - Material : MS frame powder coated & weaving of PVC rattan . All weather powder coats specially extruded aluminium alloyed section 4 seater aluminium table 120 cms with toughened glass top.